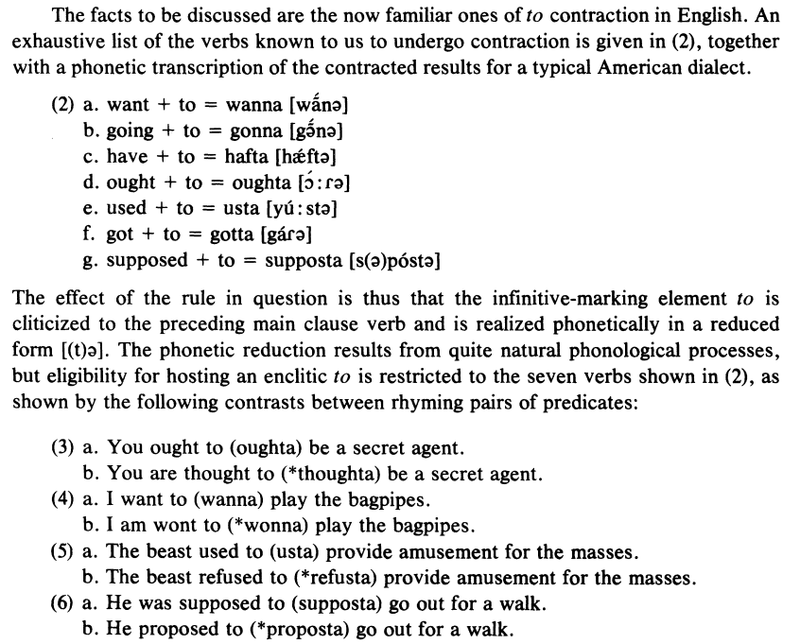 verbal phrase, 1902, representing casual (American) pronunciation of should have. The use of a or 'a to represent a loose pronunciation of have as an auxiliary verb is attested from mid-14c. and was all but standard English until 17c. (also preserved in coulda, woulda). Similar expressions like gonna (going to) and wanna (want to) have a less clear origin. Wanna and gonna are frequently used in speech in informal colloquial English, particularly American English, instead of ‘want to’ and ‘going to’. You will also see them used in writing in quotes of direct speech to show the conversational pronunciation of ‘want to’ and ‘going to’. representing the casual pronunciation of ‘want to’, by 1896.
attempt to represent the casual pronunciation of ‘going to’. In Scottish dialect, ganna, gaunna recorded from 1806. According to the above sources, the cited expressions appear to have rather old origins, but they emerged, or probably reemerged, around the end of the 19th century/beginning of the 20th century mainly in American English. Is there evidence that the older original usage of shoulda, coulda etc. actually influenced by assonance the later expressions like gonna and wanna, or have they unrelated origins? Is there a plausible reason why this “a” usage emerged mainly in AmE? Why American? That is very difficult to say! Rarely does someone have a good answer for why a specific sound change happened at a specific time for a specific speech community. We can only say what sorts of thing tend to happen, and what sort of things are rare. In this case, you see that the verb+clitic combination forms a trochee, and the unstressed syllable is the one that gets reduced. It would be interesting if a stressed syllable were the one to get reduced. In fact, we'd even start to question whether it was truly stressed. I believe this is a product of "phonetic realization" (See: Stress (linguistics), Wikipedia). Similar examples are "dropping the 'G' in 'ing'" ("doin'" rather than "doing") , and the contraction "y'all". I have seen similar changes in stress when reading old Irish poetry, so I am not sure it is expressly an Americanism. Additionally, in this article I found that "have" is cited as having a "weak form" in English (SeeL Stress and vowel reduction in English, Wikipedia. The vowel reduction in weak forms may be accompanied by other sound changes... The homonymy resulting from the use of some of the weak forms can lead to confusion in writing; the identity of the weak forms of have and of sometimes leads to misspellings such as "would of", "could of", etc. for would have, could have, etc. It is reasonable to see that the confusion with the sound of "have" when said in a weak form is heard as "of", and may also be heard as "a". I.e. Should have --> should of --> should'a. Warning: speculative rather than definitive. This answer is also a bit speculative, I'm afraid. Another perceived Americanism is to remove the H from the beginning of words, such as herb → 'erb. If you apply this to should have in order to form should 'ave, it's a short step from there to shoulda. Are there any studies on changes in British English to become more like American English? Why does American English still write “glamour” with a “u”? Are there any differences in adjective order between American English and British English?